This latest flower project was inspired by stories from my friend Erika, who briefly lived in Seoul Korea about ten years ago. Apparently, every May, the good people of South Korea celebrate Buddah’s birthday with the Lotus Lantern Festival, a time when everyone in town decks the streets with thousands of beautiful paper lanterns. They make them out of paper cups and tissue paper, then hang them from trees and fence posts and exchange them with strangers. Doesn’t that sound wonderful? Can you imagine a whole giant city lit up with paper lanterns? Man, I got to get to South Korea in the Springtime! Anyhoot, my friend Bird needed a lamp, so when we went to Chinatown last weekend, this giant white lantern came home. Now, the plain paper lantern are nice enough, but we thought it could use some dressing up. Inspiration came from the lamp on the cover of this book, and we were off! This project is so simple, it really doesn’t warrant a tutorial. All you need to do is glue the muffin cups to the lantern. Of course, knowing me, it’s the simple things that get flubbed most often! I quickly learned that you will end up with a mess if you don’t get a strategy first. 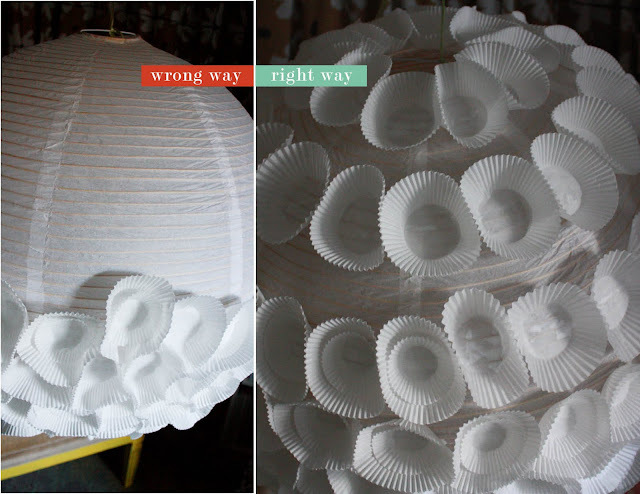 Wrong way: Glue them on in tight clusters. Yeah, you would think this method would be best, but it turns out the walls of the muffin cups like to expand as they dry….they start pushing against each other and moving each other around and sometimes they just plain fall off. Right way: Glue them on in stripes with gaps in between. Let them dry, then fill in the gaps. This way there is room to expand. Add layers and fill in holes as you see fit. This one is difficult to mess up, as long as you let them dry properly. For a lantern with a 36″ diameter, it took 300 standard muffin cups + 100 mini candy cups to accent. This will vary widely, depending on size and how thick and full y’all want your ruffles. Hot glue will dry faster, but it will not dry completely transparent and you will see glue blobs when the lantern is lit from within. Maybe there is a special technique to avoid this, but I prefer plain old Tacky Glue. When choosing your lantern, be aware of the structure on the inside and how it shows when lit from within. This big white lantern was made of very thin paper and the structure lines show, but we sorta like that that effect! 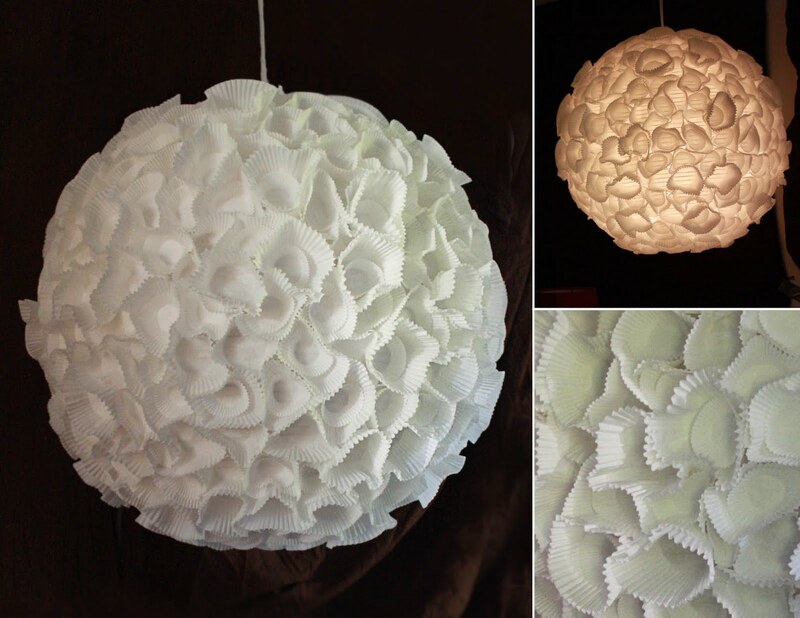 If you don’t like it, find a lantern made of darker/opaque paper, or triple up on muffin liners, or paint your lantern before gluing on anything. 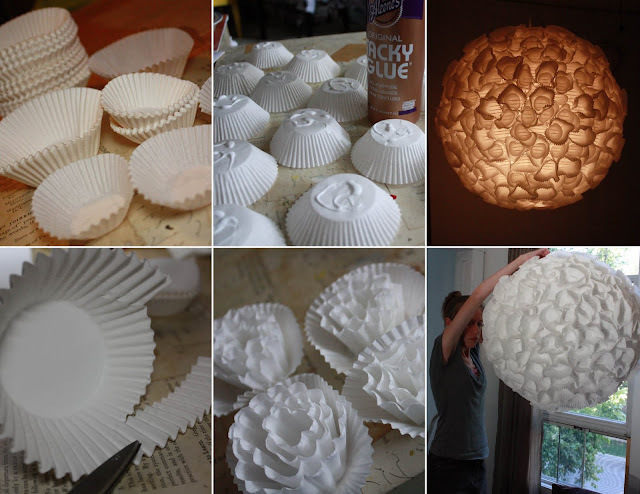 To add dimension, trim down some of the muffin cups to make smaller size ruffles to insert in larger ones. To add even more dimension, make some blossoms by rolling the trimmings and gluing them in the center. Important: this is difficult to move after it’s finished. Assemble it on location or get a friend to help you move it. Opening doors with this thing in your hands is just about impossible! Also made this little one for a BBQ this weekend using orange and red polka dot cups. Aint she cute?! 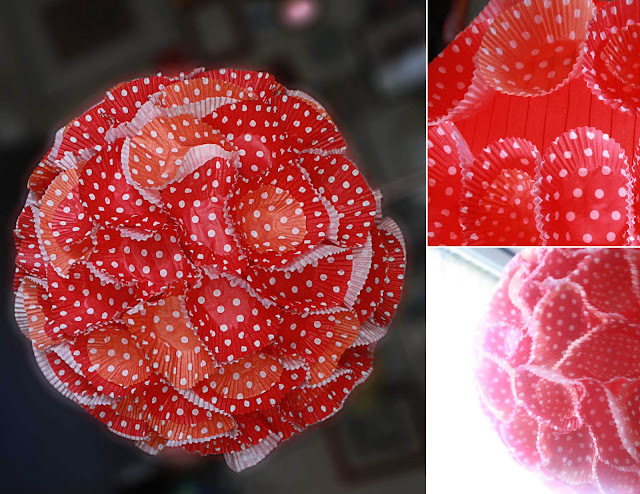 Anyone looking for a seriously nifty last minute New Year’s craft needs to check out this amazing lantern from Alison over at Backstich Baby! Wish I had thought of this one myself. Seriously considering hanging one in my bathroom all year round 🙂 Thanks for sharing, Alison! Who needs a goose feathers when you’ve got muffin cups? Brilliant idea. The lantern looks smashing! Haha, oh Mimi you are too funny! I’m glad you like it, and I’m totally with you on using the coffee filter flowers…I want to see about getting two or three lanterns in graduating sizes and hang them up in a stack. I’ll post when I get my ducks in a row!! Creative! I love the red! Thanks so much, I’ll be linking. Fantastic, this is one of the niftiest things I have seen for ages. Love every last blossom! I love this – so simple and so effective. Wow, this is super! I’m going to link to this on my weekly international blog linking party, this is just the kind of project my readers will love! Of course I’d love to see you there too, and you can feel free to link up to more projects. It’s a great crowd of really crafty types from around the world, hope to see you there! Great tutorial…THANKS for this beautiful and simple lighting idea! We would love to link to you and have you featured as our guest blogger this month! What a thing! I so love how it looks lit up. And the red one, omgomg. This is just flat out cool!!! What a fantastic Idea, my sister is a baking fantatic, she would love this project, thanks for sharing! This is great – it’s a really cool technique! Wow! Never knew muffin liners could be so fancy. It’s super. That looks so cool! Love it! Yes! We have like 20 orange lanterns leftover from our wedding last year just gathering dust in the basement – I think I’ll try this on one and use it in our office! Might be kinda cool with the orange base… Thanks! I link to your blog and this post today. I love the lamp and have posted your picture in my post. If you want me to remove it, please let me know, and I will delete it a.s.a.p. Thanks!! I saw this idea in the Family Fun magazine, but it didn’t really say how to make it that I saw. Great Idea! I want to make this for my daughters bedroom. So where would I find a lantern at? My housemate and I made one of these last week! Thank you so so much for this wonderful tutorial and the inspiring pictures! Ours is here. awesome! I’m gonna make 1 for my new house!! SUCH a good idea!! So simple and pretty! I might have to experiment…and of course there are so many pretty cupcake cases around at the moment, in pretty colours! Yes! They can handle that for sure. I demand pictures! I just scored a rather large pack of animal print cupcake liners. Epic win. Now, let’s see if I can score a paper lantern thingy in the charity shop and disgusting, sorry excuse for a lampshade that came with this dump of a house is a thing of the past. Think I could trust the kids with a glue gun?So all I’d have to do this weekend is leave some instructions, the glue gun, the liners and bugger off to work- and hopefully come back to a work of animal print art at night?